Thinking about removing a big tree? The abundance of evergreens and deciduous trees in Portland — estimated at more than 1.4 million — contribute to our city’s clean air and natural beauty. But even if a large tree’s shade and aesthetics have provided many years of enjoyment, tree removal in Portland, OR may be absolutely necessary due to liabilities and hazards or for the aesthetic appeal of your yard. Our arborists at Northwest Arbor-Culture Inc. are advocates for all trees in your landscapes and understand that for the thousands of tree species that grow in the Portland area, there is always a good fit for your home and landscape. If a big tree is a liability, hazard or doesn’t provide aesthetic value to your home, it may be time to call our arborists for a free consultation to evaluate your large tree care needs. Why Is Tree Removal in Portland Necessary? Tree removal can be seem like a big project sometimes, but finding the right trusted service can make this big, sometimes stressful project much easier to accomplish. Finding an accredited tree removal service can help with the labor-intensive work of safely removing your tree and performing stump removal. Portland is known for its do-it-yourself ethic, but large tree removal is very dangerous and stump grinding is often outside the scope of the average homeowner’s skills and tools. When Is the Best Time for Tree Removal in Portland? Ideally, contact Northwest Arbor-Culture Inc. as soon as you see any sign of decay or hazard. Routine tree removal may be done at any time of year with an experienced, reputable company. Remember, our arborists are available 24/7 to provide a free consultation, so don’t wait for the worst-case scenario before you call for an evaluation. Our certified arborists can remove your hazardous tree before heavy rain, wind or decay can cause the tree to fail, damaging your property and making a claim through your insurance. But if an emergency or disaster strikes, Northwest Arbor-Culture Inc.’s arborists are highly skilled in all extreme weather situations for hazardous tree removal. Northwest Arbor-Culture Inc. also offers 24/7 emergency tree removal and consultations. 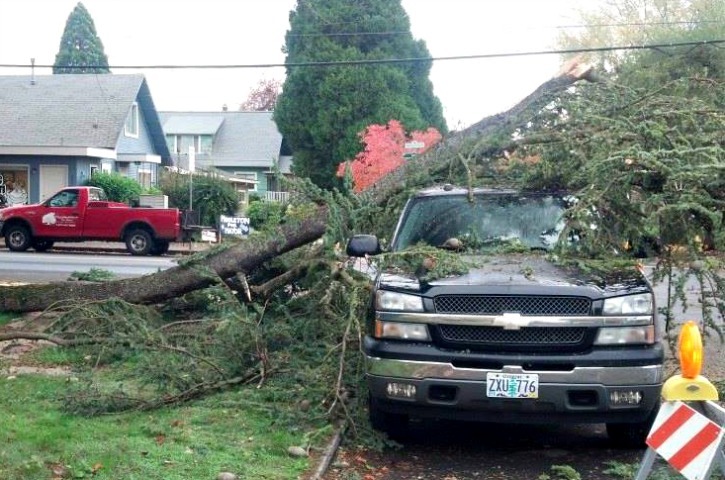 We’re here to help Portland-area residents with the most extreme situations during heavy storms and inconvenient times when you need a tree removed. What Can I Expect with Tree Removal in Portland? Northwest Arbor-Culture Inc. values your home, property, and personal safety above all else. Prior to tree removal, our certified arborist thoroughly inspects your big tree to identify damage, rot and decay as well as ensuring the landscape is safe for removal. After the evaluation, our licensed, insured, certified arborists at Northwest Arbor-Culture Inc. begin the safest removal process of your tree. In most cases, to eliminate the possibility of property damage, our arborist will use the method known as “hoist and pulley” to lower each section of the tree down to a safe point where our ground crew can dispose of the tree. Branches are mulched and reduced to a chip debris that will be removed. Larger chunks of wood, usually 4 inches in diameter or larger, can be cut into standard fireplace logs at 16-inch rounds and piled to save you money, or for an addition fee, they can be removed and disposed of. In many cases, Northwest Arbor-Culture Inc. will donate the wood to people in need. Next, at your request Northwest Arbor-Culture inc. will perform a stump grind to eliminate the stump. This will allow for the area to be used for other landscaping needs, and in some cases, a new tree can be planted where the old tree once was. The remnants of the stump are then ground down and removed from the premises and a small mound will be left to decompose, settle and level with the surrounding grounds. The homeowner is left with an unobstructed view of an unsightly tree and stump, room for gardening, a healthier yard, and ultimately a sense of relief. Why Hire a Portland Tree Removal Service and Certified Arborist? A big tree removal service in Portland, such as the certified arborists here at Northwest Arbor-Culture Inc., will be able to determine whether your big tree needs to be removed completely or simply pruned. According to the University of Maryland’s College of Agriculture, a vertical lean of 15% or more indicates the tree has broken or weakened roots and should be discarded. In addition to expertise, a tree removal service will also have the necessary equipment to remove and carry away a large tree and its stump safely, which can weigh hundreds of pounds depending on the tree’s size. 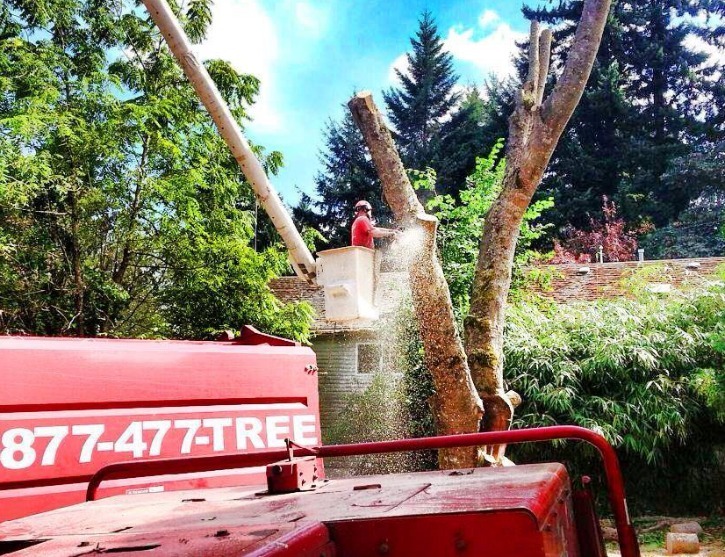 A quality, accredited large tree removal service in Portland, Oregon will also be highly familiar with the Rose City’s requirements and laws regarding permits to file and other bylaws that may affect the removal process. Does your large tree need removing? See our certified arborists’ qualifications and contact Northwest Arbor-Culture today!